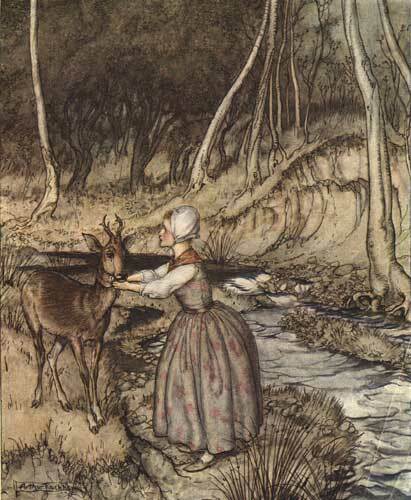 Grimms’ Brother and Sister is one of these less-than-satisfying tales. The construction of the story is partly to blame. As events flow along I sense the narrator saying, “Oh, by the way…” and filling in information pulled out of his hat. The story starts with a lengthy declaration by the brother to his sister that their life is unbearable under the blows dealt to them by their stepmother, and they would be better off “in the wide world.” They travel into the forest, spending the night in a hollow log. Oh, by the way, the stepmother is a witch, and when she sees the children are gone, she follows, putting a curse on all the springs in the forest. Upon waking, the brother is possessed by thirst and leads them toward the sound of a spring. The sister hears the spring say whoever drinks of it will turn into a tiger. She dissuades her brother from drinking. The next spring threatened to turn him into a wolf, and the third spring into a deer. Overcome by thirst, the brother drinks from the third spring, becoming a fawn. When the stepmother/witch hears of the children’s good fortune, she makes her plans to end it. Oh, by the way, the stepmother/witch has an ugly daughter with only one eye. On the day of the sister/queen giving birth to her son, the witch and daughter, changing their appearance to be that of servants, take the queen to her bath, overheat the water and lock her in to suffocate. The witch casts a glamour over her daughter, giving her the appearance of the queen, but there is nothing she can do about the missing eye, a defect that they need to keep hidden from the king. 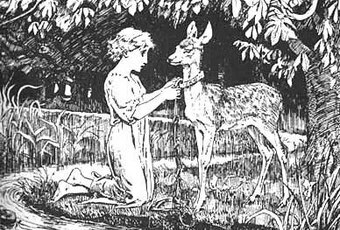 However, the real queen’s ghost reappears nightly to nurse the child and pet the fawn. When the king discovers this, he breaks the spell, returning his true queen to life, consigning the ugly daughter to be torn apart by wild beasts, and the witch to be burnt. After the witch is reduced to ashes, the brother returns to his human form. Amateur that I am, I defer to my betters on matters of perspective. I know no one better than my good friend Augustus. Armed with encyclopedic knowledge and undeniable artistic taste, Augustus is my mentor when I wander into the fairy realm. I will go see him. Besides, I need tobacco. The bell above the door triggers a familiar ring as I enter Augustus’ store. He already stands behind the counter, expecting me. Oak, glass, the street noise silenced when I close the door, heavy odors that baffle my senses; this is Augustus’ Tobacco Shop. We enter into our ritual greetings. “Good day,” he says. Augustus walks down the row of glass canisters. He passes by Elfish Gold, Leprechaun Gold, Old Rinkrank, Cobbler’s Delight, and Black Dwarf. He pauses at Evening Star, but settles on Pleiades’ Pleasure. He puts some in a silver bowl, sniffs it, and adds a little dark, shriveled Perique. He and I take to the overstuffed chairs at the back of the store; fill, tamp, and light our pipes. “Are you familiar,” Augustus asks, “with Dawkins’ The Little Boy and His Elder Sister, from his work Modern Greek Folktales? Pleiad, our heroine, has lost her mother, the queen. The new queen, having no love for Pleiad, convinces her husband that they should sell his daughter. She is locked in a room and fed nuts, figs, and sweets to fatten her up a little. Augustus pauses to relight his pipe. “The mother soon understands the ruse and chases after them. As she is about to catch them, Star of Dawn throws down the ribbons, which turn into a wide plain, the mother at the far end. When she catches up to them again, he throws down the comb, which turns into a dense forest. Still she gains on the children. Star of Dawn throws down the small bag of salt given to him by the wise woman. It turns into a sea that the mother cannot cross. “Now exhausted, Star of Dawn craves water and is about to drink some that has settled into the hoof print of a calf. Pleiad stops him, saying, if he drinks, he will turn into a calf. They come across the hoof print of a lamb. Again Star of Dawn is warned, but he gives in to thirst. Tobacco smoke surrounds us, swirling, creating our story space. “The king’s men come to water their horses, but the horses will not drink, seeing Pleiad’s reflection. The king himself comes and pleads with her to come down, but she will not. They all leave, but the king sends back his son, an old woman, and a pig. The old women sits under the tree, trying to knead her dough on an overturned trough with the pig stealing bits of it. 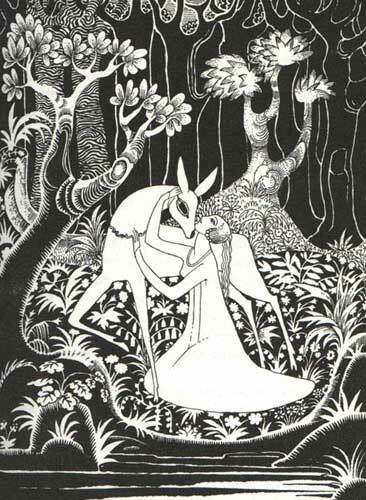 Pleiad climbs down to rescue the old woman from her foolishness; the prince seizes Pleiad, and rides off to make her his bride. At her pleading, the lamb is brought into the castle garden. “Pleiad is hated by her mother-in-law, who pushes her into the garden fountain and orders the lamb prepared for the evening meal. Pleiad prays to God to release her from the fountain, but she is too late to prevent the blade from being drawn across her lamb’s throat. Augustus shatters my image of Pleiad being propelled into the heavens. The smoke has cleared. Augustus smiles, recognizing he has set me off center. “Possibly.” I feel Augustus entering speculative territory—his favorite place. “Countless times poor souls have been enslaved, taken from their homes with the clothing on their backs and whatever they carried in their heads. How many of those were taken to distant lands, ending up tending the children of their masters, drawing on their stories to entertain the little ones? “Look to the Uncle Remus tales taken down by Joel Chandler Harris. In Africa the rabbit is the trickster, come to America as Brer Rabbit, inspiring the Warner Brothers’ entourage to come up with Bugs Bunny. Oh, the studio never acknowledged Brer Rabbit as Bugs Bunny’s predecessor, but I’ll bet my best meerschaum on it. “Certainly not. The Jack tales came to America carried by the English and Scottish; mind you though, some of them were indentured servants. But, let me argue, willing immigrants tend to embrace their new home, leaving behind associations with their old home. Slaves will hang onto their former culture, making what adaptations and disguises they must to placate their masters. I sigh and relight my pipe. The bell above the door rings and Augustus is up to please another customer.